Dr. Pepper Guy, also known as Larry Culpepper, is an ad character created by Deutsch for Dr Pepper back in 2014. Larry is a football-crazed fan and is seen as a successful campaign for the brand. 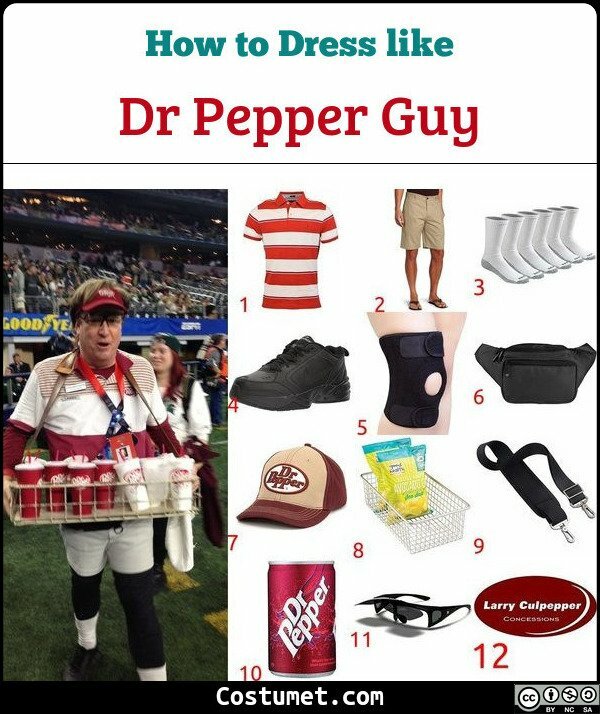 The Dr. Pepper Guy is a middle-aged man who wears a red and white polo shirt, khaki shorts, a kneecap support, a Dr. Pepper hat, and a concessions tray full of Dr. Pepper. Here’s everything you need to look like Dr. Pepper Guy. 1 Red and White Polo Shirt Look smart in a red and white polo shirt, the colors of Dr. Pepper. 2 Khaki Shorts Pair your nice polo with an equally smart pair of khaki shorts. 3 White Crew Socks Larry likes to wear white crew socks. 4 Black Rubber Shoes Match your outfit with a sturdy pair of black rubber shoes. 5 Black Knee Support Selling Dr. Pepper drinks can be hard work so Larry needs to wear a black kneecap support. 6 Black Fanny Pack Larry wears a black fanny pack. 7 Dr. Pepper Cap Larry keeps himself from the heat with the Dr. Pepper cap. 8 Stainless Steel Wire Basket Use this wire basket as base for your concessions tray. 9 Black Straps Connect these black straps so you could wear your concession stands. 10 Dr. Pepper Cans Put Dr. Pepper cans so you could sell your own drinks. 11 Flip Up Fit Over Sunglasses Larry is often seen wearing this. 12 Name Tag Optionally add this name tag on your shirt. Dr. Pepper Guy ( Larry Culpepper) was portrayed by James M. Connor. He also played Deputy Commissioner Podolski in Brooklyn Nine-Nine and Seychelles in Vice Principals.